Set in Victorian London, Tiki is about as poor as poor can get. She is basically an orphan after her parents both died when she was a young teen. Now, a year later, she is living in an abandoned clockmaker's shop with other children who are essentially homeless. They steal and find any way they can to put coal in the stove and a little food in their belly. Tiki herself has become a master pickpocketer. One night, she finds herself at the back door of a kitchen where food is bountiful. She sneaks in and before the night is over, she has a beautiful red ring that is sure to bring her a lot of money. What she doesn't know is that she just stole a faerie ring that is a bound truce between her world and the faerie realms, and that was no ordinary house. That was Buckingham Palace, and she swiped the ring from under the Queens nose. 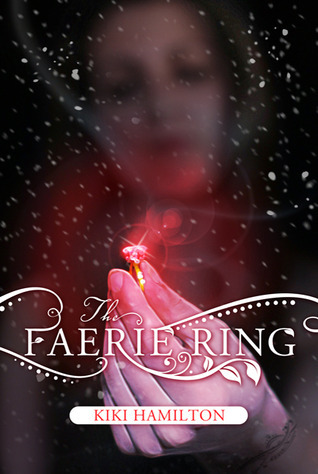 The Faerie Ring transports you back into a time where people take leisurely strolls through the park, drink tea in sitting rooms, and masked parties kept the rich busy. Tiki does none of those things. She is too busy caring for the other destitute children. I love her kind and generous heart. She is a giver and takes nothing for herself until the others are tended to. She is brave, bold, and selfless in everything that she does. Every step she takes is in the direction of her helping someone else. Up unto the last pages of the book, she is thinking of the children she cares for and puts herself second. She doesn't even question things about herself because she is too busy concentrating on everyone else. Even though she is a thief, I see her as a role model. I love the concept of this story and this book has a lot going on. Mystery, adventure, suspense, romance, paranormal elements.... After Tiki steals the ring, she finds herself in the middle of a war of the worlds (literally) and isn't sure who to trust. Rieker, a legendary thief, says he can be trusted, but every time Tiki thinks she knows him, a secret is unveiled. Rieker seems to know a lot about the fey and the royal family, but doesn't bother filling Tiki in. In fact, he seems to keep things from her. The two go round and round until one eventually has to trust the other. The mystery of Rieker is parallel to Tiki herself. As a child, she sat listening to her mother tell stories of the fey and she never thought twice of them. Tiki's strange birthmark grabs the attention of Rieker and he seems to be around every corner from that moment on. Their cat and mouse game is endearing. I was frustrated with Rieker at times for not telling Tiki some truths about herself. I hated to see Tiki walk around in a cloud of doubt. There is resolution in the end and leaves room for book two. I hope there is a book 2! Great low fantasy that will only leave you wanting to take a carriage ride and look at your friends birthmarks. Great start to a hopefully long series! You can find Kiki right HERE on her website.